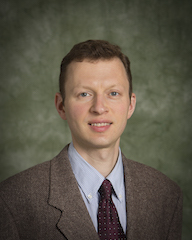 Dmitry Ponomarev is a Professor in the Department of Computer Science at SUNY Binghamton. His research interests are in the areas of computer architecture, cybersecurity, high-performance computing and parallel discrete event simulation. He published in leading conferences in these areas, including papers in ISCA, MICRO, ASPLOS, HPCA, CCS, DAC, ICCAD, ICS, PACT, IPDPS and SIGSIM-PADS. His research has been funded by the National Science Foundation, the Air Force Research Laboratory, the Air Force Office of Scientific Research and Intel. In 2016, he received SUNY Chancellor's Award for Excellence in Scholarship and Creative Activities. Four of his PhD students have been recepients of Binghamton Graduate Student Award for Excellence in Research. MICRO'16 paper on ASLR attack was selected for presentation at Top Picks in Hardware and Embedded Security Woskshop (at ICCAD'2018).